We have a new saying at our house. "If something is going to happen, it'll happen to the puppy." my poor accident prone puppy. Who knew playing in the backyard could be so dangerous! First we're playing and then she's limping and has blood spattered all over her belly and legs! It was her paw, my poor little Golden Girl cracked her nail. Well that ended play time pretty quick. And so much for our walk too! I called the vet and everyone had just left the office, the nurse I spoke to said to soak it, wrap it, and tomorrow if we think it might need to be removed to come into the office. 1. Soak the injured foot in warm water with Epsom salt. Don't worry the Epsom salt doesn't hurt, but you want it to be as clean as possible to avoid infections. 2. Place a cotton ball underneath the nail that is broken. We did this because her nail split on the underside, the cotton ball provides cushion to the broken section while she walks, keeps the bandage from sticking to the nail, and prevents her other nails/toes from rubbing her injured nail. 3. Using a self-adhesive bandage, carefully wrap the injured foot. Careful to not wrap it too tight! 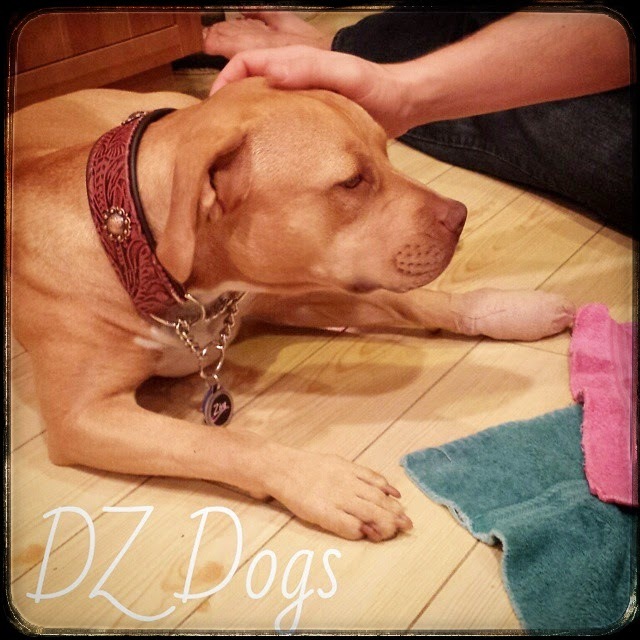 We learned that if we wrapped her dew claw into the wrap then the bandage stayed on better. When we left the dew claw out, the bandage worked it's way off in about an hour. 4. Try to keep your dog off their foot, rest, no running. First wrap - dew claw out. The bandage didn't stay on. On a good note - after visiting the vet this morning she said the nail doesn't need to come off. Ziva cracked it pretty good, but it isn't ripped. It might end up falling off on it's own, but it has a good chance of healing. For the time being, she said to soak it daily, and keep it wrapped until it feels better for her to be on it. She also said a bit of baby powder might be a good idea to put on her foot before we wrap it. Too much moisture can cause skin problems, and create a potential infection. Her nail needs to heal on it's own. She then gave us some an anti-inflammatory/pain killer. 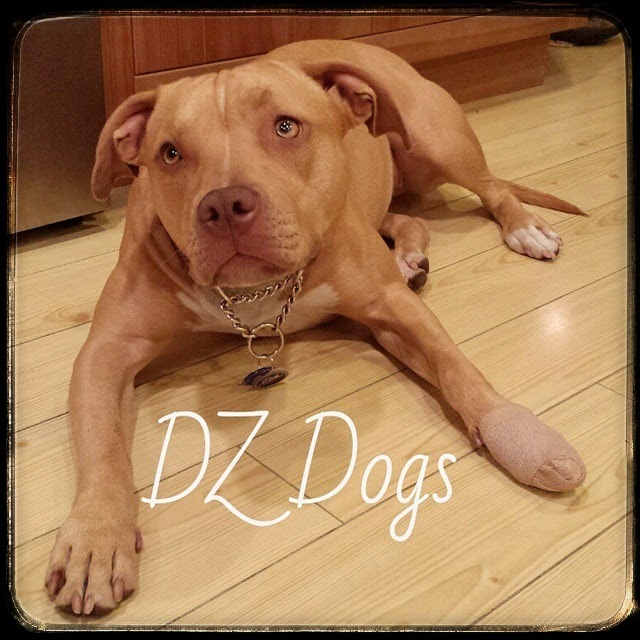 We're thankful that the puppy didn't need to have her nail removed! Good heavens, poor Ziva. And poor you, you must have freaked out when you saw blood! Did you use vet tape? I love that stuff and use it when Sampson is licking at this paws. Thank you for joining the blog hop, I hope Ziva's nail feels better fast!! Sounds so painful but glad we know what to do in case that happens to us. Hope your nail heals quickly!! Been there. Done that. 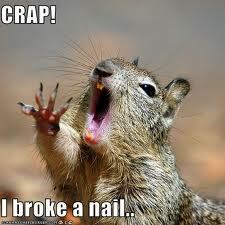 Freighter cracks a nail a week because he is a maniac....lol. We had to have one removed because he also jammed it, the nut. Glad to hear Ziva is on the mend. Thanks for joining the Barks and Bytes hop! Poor baby girl! Glad that she's on the mend. She looks so sad in that last picture--hope she's getting lots of extra snuggles! Ow ow ow. Glad to know it doesn't have to come off. I would have been freaking out when I saw all that blood. Her face in the last picture says it all..
PepiSmartDog: Great post. Hope he's making a speedy recovery. One of my kittehs snapped up a front claw and under surgery they discovered more problems and she had to have her whole toe amputated. Mom almost had a catniption when she was told. Now Tahni has a Hawaiian paw wave! Hope your puppy's feeling better.